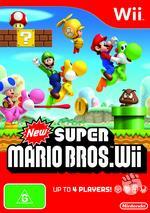 The ultimate Wii game of 2009 has arrived... New Super Mario Bros. Wii! Paying homage to the original side scrolling Mario games of yesteryear, New Super Mario Bros. uses the same winning formula that made this franchise so popular as the player collects coins, defeats bosses and of course uses a variety of different powerups. Oozing with classic gaming, Nintendo have revolutionised their platforming success with the inclusion of the innovative motion control of the Wii, new Mario power-ups and best of all, up to four players at once for a true Marioextravanganza and as Mario would say Here we go! In some areas, players use the motion abilities of the Wii Remote controller. The first player to reach a seesaw might make it tilt to help his or her character. reach a higher platform – and then tilt it incorrectly just to mess with other players. Although the title looks like previous side scrolling Mario games, Nintendo have added a nice shine and polish to the characters in this game and even though its essential a 2D game, the characters look 3D. 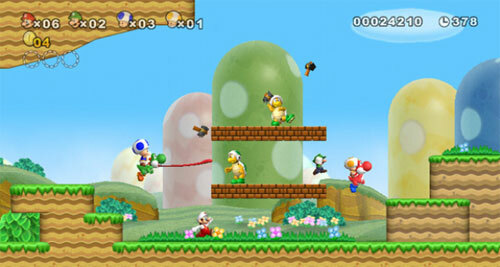 In single-player mode, the player must traverse Mario through a variety of different worlds, each with their owns themes and eventually some interesting bosses to fight as you jump, run and powerups to victory. As opposed to other Wii games, you use the wiimote on its side like a traditional arcade controller, however some of the new power-ups such as the propeller for Mario need the player to shake the control up and down for Mario to get air which is very cool indeed. Control wise, it's pretty much left, right and jump. 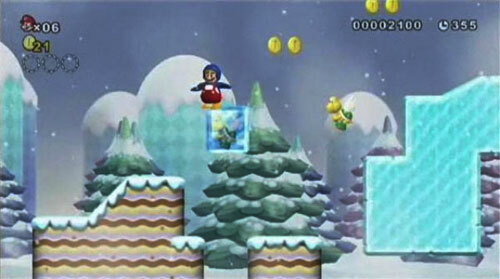 In relation to the new powerups such as the Ice Flower and Fire Flower, the gamer must shake the controller to activate them and our favourite new powerup is the Penguin Mario. In single-player mode, there are flags which must be reached throughout the level which serves as a checkpoint and thankfully these are not far and few. Defeating enemies is generally by bouncing on their heads or using a new power-up like the Ice Flower to freeze them and then smash their ice cube. Of course, the turtle shell is still a favourite as it wipes out whatever is in its way. Bosses are a little more challenging but still the same rules apply. The single-player mode New Super Mario Bros. is very cool, however the multiplayer aspect of the title is phenomenal as up to four players can play on screen at once. In terms of multiplayer, gamers can play either Mario, his brother Luigi or two Toads and it would have been cool if Princess Peach or someone more memorable was available. In essence, the characters are the same but where the game shines is through the cooperation of each of the players which also adds a challenge aspect to the game. Because if you die, you reappear in the world in a bubble but you need another player to pop the bubble which is frustrating when they are grabbing all the bonuses. This also means that you can virtually finish the game together unless you all die at the same time which would be fairly rare. With two players it's manageable but when you're playing with four, it's a true Royal Rumble. As you race players or challenge them in a coin battle to see who can collect the most coins, multiplayer like this was unthinkable when the game was originally released. Apart from the main theme of getting from A to B, players must also collect Red Coins and Star Coins which helps in boosting your score and you can also opt to rescue toads in order to usher them to safety. This is tricky because when you carry them you are limited to what you can do but throwing them around is fun. Veteran gamers should have no issue with the controls or designs of the gaming environments, it's basically quite mathematical and if you watch the levels and how the characters move, figuring it out should be no problem. 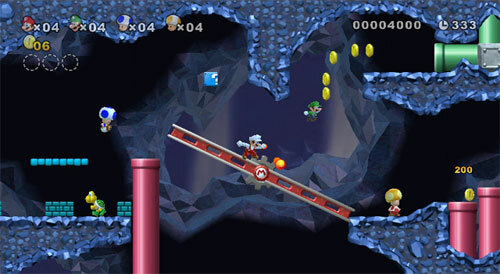 However, if you die too many times, the game will bring in Luigi to finish the level for you which is very cool. You can even see how you should have been doing that jump or defeating that particular character. There are even videos of secrets and tips available to the player which are unlocked by star coins. In terms of online mode, the game is lacking anything substantial but with such a well designed game, one can understand Nintendo's decision. Graphically, the title is rather plain but it actually works quite well from the Spartan environments to the colourful characters and 3D characters that move quite well. Add in some special effects and although the game looks like its original conceptions, the game does have a 21st century twist to it. The music is oozing with Nintendo goodness and once again Charles Martinet comes back to voice our little plumber from Brooklyn. Of course, the voices and sounds of Mario always puts a smile on my face. Another nifty little effect is that some of the sound effects come through the wiimote which is quite cool. Even after all these years, the classic Mario gameplay still remains quite strong and as you progress, the game does become challengingly more difficult which is all part of the world of Mario. With mesmerizing music and gameplay to boot, New Super Mario Bros. Wii is an addictively entertaining experience that once again proves the old analogy that if it aint broke, don't fix it! Bravo!